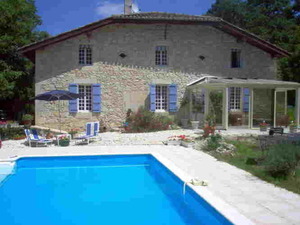 Gramont is on the border of the Gers and Tarn-et-Garonne, 6 kilometers from St Clar and 14km Lectoure The old stone farm house is set in a tranquil country setting 1,2km from the centre of Gramont. Alan and Sylvia would like to welcome you to our little corner of paridise, a place to come and relax and watch the world go by. We try to cater for all your wishes so that your stay with us will be a memorable one and hope that when its time to leave you go relaxed ready to face the world again with happy memories of your stay in Gramont The house is secluded which will allow you to enjoy the local wildlife An ideal place to come home to after a long day sightseeing or house hunting during the summer months take a swim before dinner or a stroll down the country lanes .The nearest shops and bars are in the small village of St Clar. We can accommodate up to a max of 7 people. We have one downstairs double bedroom with private bathroom. On the first floor there is another large double bedroom with private bath and a connecting door to a twin bedroom making it an idea combination for families. All of our rooms are individually styled and offer tea and coffee making facilities, an in-room bar and CD system. Twin or doubled bedded rooms also have private bathrooms with bath, seperate shower, WC and twin sinks. Family suites have one twin room with connecting bathroom which leads to a double bedded room. Free bottled water is supplied daily Most rooms over look the garden or pool area. The double bedrooms also has a seating area in the room for relaxation. Breakfast ( Which includes cheeses fruit cereals yoghurts eggs fresh breads etc ) may be taken on the terrace during the summer months. If you require a meal or light supper on arrival please state this when booking. We do offer table d'H?tes from 12 euro for 2 courses to 18 euro's person per night for 4 courses including wine.Children from 8 euros. we can also provide packed lunches with wine.This needs to be ordered the day before. There is however a large selection of excellent restaurants in the area which cater for all tastes. The area is renowned for its gastronomy, including especially duck and foie gras. There are numerous restaurants ranging in price from 12 euros up to 50 euros to try out. The local wines are excellent and give good value for money, and it is essential to try the Armagnac and the aperitif "Floc de Gascogne". There are tours around some of the vineyards at no charge (Monluc, Cassaigne, for example). The town of Condom is easily and quickly accessible, and you can have boat rides along the river Baïse, visit the Armagnac museum, and the museum of "préservatifs"! The smallest walled town in France is a fascinating part of a short tour of the Gers which could also include the remains of the Roman villa at Séviac. And don't forget the garlic festivals in Beaumont and Saint-Clar! Agen, Montauban (Ingres Museum), Albi (Toulouse Lautrec Museum), Toulouse (France's 4th largest town) are all within easy travelling distance, along with the Pyrenees, Cahors, Auch, Tarbes, Pau and Lourdes. Carcassonne is about 11/2 hours' drive. The sea is about 21/2 hours away to either Med or Atlantic. Other local attractions include: Honey Museum, Châteaux at Gramont and Marsac, Water Sports Centre at St-Nicolas-de-la-Grave, golf at Espalais, the cloisters at the abbey of Moissac (UNESCO listed), the Abbey at La Romieu (UNESCO listed).